To support these disparate fractal types, the Fractal Science Kit is partitioned into 3 major components, each serviced by a different fractal generation framework. While there are many shared concepts/resources (e.g., transformations), the basic framework for each fractal type is quite different. 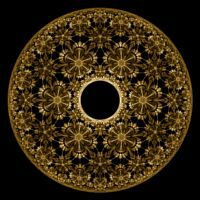 See the Fractal Image Gallery for examples of each of the fractal types. Mandelbrot Fractals include divergent and convergent fractals that can be produced by iterating a fractal formula with respect to a sample point on the complex plane and coloring each sample point based on the size and characteristics of the resulting iteration. Mandelbrot Fractals encompass several related fractal types including Mandelbrot fractals, Julia fractals, Convergent fractals, Newton fractals, and Orbit Traps. 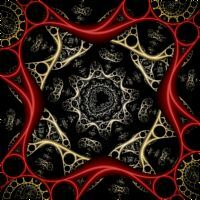 Orbital Fractals include those fractals produced by iterating a fractal formula a fixed number of times, keeping track of those points that are visited during the iteration, how many times each point is visited, etc. Each point is colored based on these accumulated statistics. 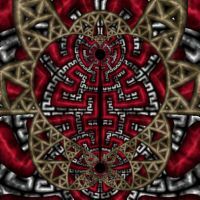 Sierpinski N-gons, IFS fractals, Strange Attractors, Dragon Flames, Rep-N Tiles, Apollonian Gasket fractals, Circle Inversion fractals, Kleinian Group fractals, Symmetric Icons, Symmetric Attractors, Mobius Dragon IFS, Mobius Patterns, Grand Julian IFS, Elliptic Splits IFS, Splits Ngon fractals, Frieze Group Attractors, Wallpaper Group Attractors, and Hyperbolic Attractors, are all examples of Orbital Fractals. L-System Fractals are generated from a sequence of statements or rules that recursively define the movement of a virtual pen to produce a fractal.